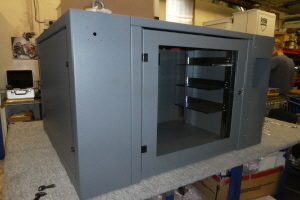 We have been working closely with an aerospace manufacturer of co-ordinate measuring machines to design and manufacture this 19″ 13u enclosure which houses rack mounted computer, data logging and power supply units. 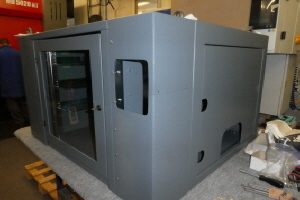 The project was taken on at short notice and we have pretty much designed the enclosure from scratch working from initial concept to build. It is designed using Solidworks and manufactured in 2mm and 3mm mild steel with a fully welded construction, powder coated grey. 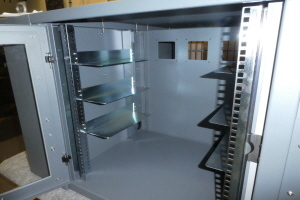 The Front door is toughened clear glass enabling operatives to view the status of the electronics without exposing the rack mounted units to the working environment and the pneumatic control panel is accessed through a side door for easy maintenance. The enclosure is now assembled with its inspection table and robotic arm and is in use and we are now expecting orders for additional units. 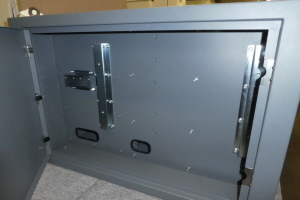 This is typical of the high end electronic metalwork we design and manufacture and if we can help you, please get in touch.